A University of Texas at Arlington electrical engineer is working in collaboration with a pioneer in the field to develop an implantable optical probe that can be inserted in the brain and used to monitor brain function after traumatic injuries or surgeries, then be absorbed by the body. If successful, the device would increase patient comfort during recovery and lessen the risks of complications from surgery to remove monitoring devices. Weidong Zhou, a Distinguished University Professor at UTA in electrical engineering, recently received a $200,000 Partnerships for Innovation grant from the National Science Foundation to apply fundamental research derived from his work with John Rogers, a world leader in the field of bioresorbable or biodegradable electronics at Northwestern University. Rogers was the lead author on a paper that was recently published in the journal Advanced Materials on which Zhou was a co-author, that describes their use of flexible optical waveguides in biosensors. Waveguides are physical structures used to guide light, usually in integrated optical circuits or optical communication systems. Bioresorbable optical systems can be a powerful tool for diagnostics and monitoring in patients who have suffered a traumatic brain injury or who have a brain disorder. When physicians treat these patients, they often need to insert a device to monitor intercranial pressure, temperature and other brain functions. Current devices are rigid and bulky, are made with electronics that can cause interference with other devices and must eventually be surgically removed. Rogers and Zhou have designed a device that will rely solely on waveguides and optical cavities, so there are no metal or electronic parts to rust or interfere with signals and the optical elements will be absorbed into the body after a period of time, eliminating the need for further surgeries. That will reduce post-surgical complications, pain and recovery time for the patient. Rogers is working on how to integrate the device in the body so it can be used with monitoring equipment. "I've been working with Dr. Rogers for years on transfer printed flexible semiconductor nanomembranes. We began exploring how to integrate optical waveguides and nanophotonic cavities for bio-implantable optical probes to make them more comfortable and introduce the ability to have the body absorb the devices completely," Zhou said. "With this grant, we can explore making the device commercially available, as well as identify other areas in which it could be used, such as understanding brain activity and functions through monitoring." The Partnerships for Innovation Program identifies and supports NSF-sponsored research and technologies that have the potential for accelerated commercialization, including the development of prototypes that have potential market value and the development of multi-disciplinary innovation. "PFI grants helps fund discovery by bridging the gap between fundamental research and a serious commercialization effort," Zhou said. "We've done the fundamental research and now we're ready to develop a system that will allow us to bring our device to the marketplace." Zhou's research is an example of innovative thinking in the areas of data-driven discovery and health and the human condition, two themes of UTA's Strategic Plan 2020: Bold Solutions | Global Impact, said Jonathan Bredow, chair of the Department of Electrical Engineering. 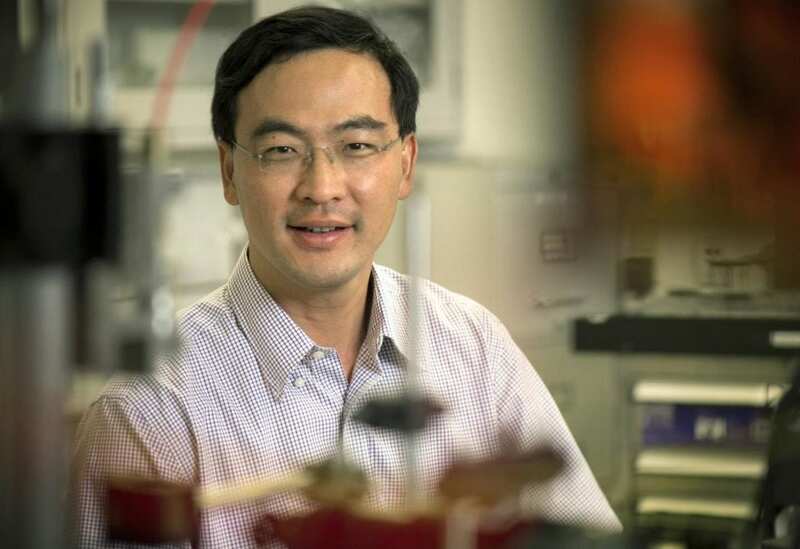 "Dr. Zhou has long been interested in applications of photonic sensing, and his collaboration with Dr. Rogers, one of the pre-eminent minds in the field of bioresorbable electronics, has already led to some amazing discoveries," Bredow said. "This NSF PFI grant is an important step in commercializing their work to benefit patients who have suffered brain trauma."